Window tinting is used for many different reasons. Some of us are looking to enhance the apearrance of the vehicle. Some are looking to keep the interior cooler and protect their upholstery. Still others are simply looking to create a more comfortable driving experience for themselves and for their family by reducing harmful UV and infra-red sun rays and glare. Professionally installed solar control window film applied by a reputable, authorized window tinting company can provide all this and more. Serving the Inland Empire and surrounding areas since 1981, we at A-1 Precision Window Tinting have tinted thousands of cars for individuals just like you, and we take pride in the fact that most of our business comes from repeat customers and referrals. Well known in the window tinting world,our senior tinter has defeated local and european champions in tint competitions and has over thirty years of personal, hands on local experience serving the Norco, Corona, Eastvale, Riverside and surrounding areas. Our shop is centrally located and an easy drive from Ontario, Chino, Chino Hills, Rancho Cucamonga and Yorba Linda. At A-1,we understand that the better your tinted windows look for the duration of your vehicle ownership, the more likely you are to call us with your future window tinting needs. We offer top of the line materials at affordable prices. To learn more about the specific protection features and other details about our films, please browse around below. The same base technology as our supreme series, HP supreme has an additional metal content for greater heat stoppage. However with the changes in automotive technology more and more vehicle manufacturers are advising to stay away from metallic films on vehicles with glass mounted anteneas, navigation or tire pressure monitoring systems. 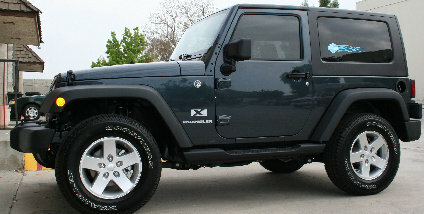 To learn if this is the window tint foryour needs click on the jeep. At A-1 Precicion Window Tinting, we are proud to an authorized Solar Gard dealer. Click here to find out what that means and learn more about the manufacturer that produces our materials. For price estimates and appointments, click here. Our most popular tint, our Supreme series is a patented technology film designed for todays vehicles.Full compatiblity with all GPS, Bluetooth and glass mounted antenneas make this an excellent, affordable choice for todays technology loaded vehicles to bring you years of trouble free driving. Don't settle for cheap "dyed", "triple dyed" or "dye impregnated" film. 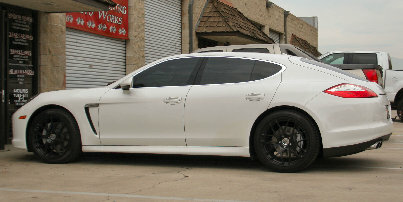 Our Supreme window tinting is a better choice. Click on the white Porsche to learn more! This pic shows our Supreme window tint keeping this Land Rover cool and stylish. 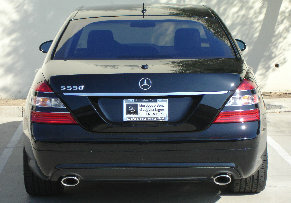 This photo shows a Mercedes S550 with medium Supreme tinted windows. Ultra Performance is a state of the art window tinting film constructed to keep you cool and comfy by blocking Infra Red rays from passing thru the glass. Using exotic materials and the latest in Nano-Technology this is truly the Rolls Royce of window films. It is fully compatible with all glass mounted antenea, bluetooth and GPS systems. Don't be fooled by so-called "ceramic" window films, this is the real deal. Click on the black Porsche to learn more! This Porsche has a medium to light Ultra Performance tint. even with a light tint.